Raphael was born on April 6th, 1483 in Urbino, Italy. Raphael grew up in Urbino where he was born into a family of art. His dad, Giovanni Santi was his mentor throughout his childhood and taught Raphael the basics of the art culture. Around 1504, Raphael moved to Florence. Raphael developed skills from his father Giovanni, until he died when Raphael was 11. Raphael then joined the workshop of Perugino, his first apprentice. At the workshop Raphael studied and practiced making borrowed ideas into his own. Raphael created paintings. A few most famously known pieces include The School of Athens, which was featured in the room Stanza della Segnatura, The Parnassus, and Disputa. Besides for Giovanni, Raphael's dad, Raphael had one main patron throughout his life. Pope Julius II was said to be known as an extravagant patron, but Pope Leo X, and Agostino Chigi also assisted Raphael throughout his art career. Raphael was vaguely related with all of the four isms, but the most prominent ism was humanism. The art Raphael produced was seen as intellectual, and his works showed beauty and glorification to men and their ideals. Individualism was also present, because Raphael discovered his talent as an artist, and his discovery created him into the type of artist he became. This is Raphael's most famous piece. It was created between 1509 and 1510 as part of Raphael's commission to decorate the Stanza Della Segnatura, which is a room of painted walls. The Stanza Della Segnatura is located in the Apostolic Palace, residence of the Pope, in Vatican City. This painting was one of the most famous frescoes in the Italian Renaissance. Raphael used an artistic motive where a mental state is expressed by physical actions. Within this painting there are identities of world renown Greek philosophers and mathmeticians like Plato, Artistotle, and Socrates. These identities all shared their theories and ideas to one another. 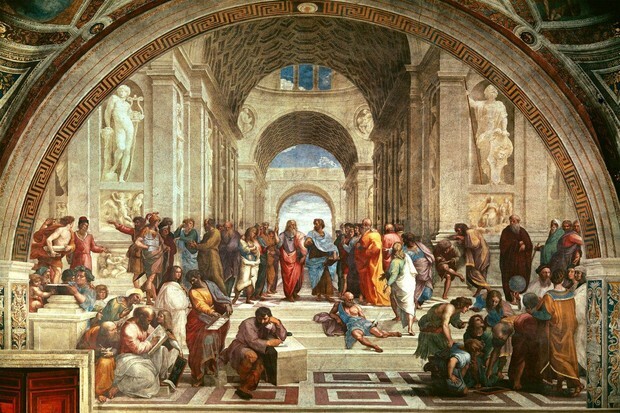 This painting by Raphael demonstrates the overall understanding between the philosophers. They are eager to have their ideas heard and shared, even though their ideas vary. The School of Athens painting represents Scientific Naturalism because all of the ancient philosophers and scientists are sharing their ideas to try to broaden another's perspective. Apollo and Athena, the goddesses of art and wisdom are seen looking down upon the scientists and philosophers to watch over them as they share their beliefs.